An exhilarating set of cutting-edge and melodic jazz from one of San Francisco's most creative groups. 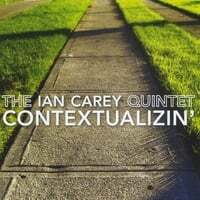 CONTEXTUALIZIN' is the second release from the Ian Carey Quintet, a tight group of five Bay Area improvisers who have been developing their chemistry for the past six years. Along with the leader's trumpet, flugelhorn, and compositions, the group features Evan Francis (of Spaceheater and the Jazz Mafia) on saxophone and flute, Adam Shulman (of the Marcus Shelby Orchestra) on piano, Jon Arkin (of Albino) on drums, and San Francisco jazz legend Fred Randolph on bass. The album presents eight original tunes by Carey, including SOCKDOLAGER, a hard-hitting minor blues featuring Shulman's Fender Rhodes; the gentle ballad NO YOU, highlighting Evan Francis's inventive flute; TOM/TOM, a burning tribute to trumpeters Tom Peron and Tom Harrell; DISINVITED, an intricate and thorny suite; and CONTEXTUALIZIN', a driving, rock-inspired tour de force. The group also performs their re-imagining of the beloved standard JUST FRIENDS. "Ian Carey is a gifted young trumpeter and composer who asks deep musical questions and comes up with compelling answers." - Bill Kirchner, composer/educator, and editor of The Oxford Companion to Jazz and The Miles Davis Reader. "I dig Ian Carey. He's a trumpeter with a clean, clear sound who understands that there are listeners at the other end of recordings. On his new album, you hear Ian's tender sound on the horn and his passion for harmony. Deep down, Ian's a romantic traditionalist, and his reverence for velvet simplicity and heart-touching tones is evident. When the music on this album hits your ear, you want to hear more. It's a strange sensation. All of the songs on the CD except one (Just Friends) were composed by Ian, and all clearly were carefully thought through to maximize warmth and gentle urgency. Fortunately, Ian's quintet is of the same mind... I can't stop playing this CD." "Carey's self-deprecation in his liner notes would have you believe that he's not much of a trumpet player. It depends on what you mean by playing. True, there's not a double high C anywhere on the album and no jet-speed series of gee-whiz chord inversions. Let's settle for good tone, lyricism and contiguous ideas that lead somewhere. Carey and his young sidemen are in tune with one another, in every sense. In Adam Shulman he has a pianist who understands Bill Evans and in Evan Francis an alto saxophonist to keep an ear on." "Getting his inspiration from the source, [Carey] plays with a real feel and understanding of what it's all about. A trumpeter that knows how to give the rest of his ensemble some, he's one of those cats you don't really know that can load the deck with originals and not scare you away. Certainly a welcoming release, he shows he has everything it takes to go the distance and delight us all the way... this is clearly the real deal." "The album title speaks to some broader point about how Carey wants to tell his own story and create his own landscape ... That's not exactly high-concept, but it definitely befits the material. Of the album's nine tunes, eight are originals, and many have a tricky format... Of course, Carey's band is the real payoff. Arkin is the consummate 'good pocket player.' Shulman and bassist Fred Randolph help solidify the rhythm section, while Francis and Carey skate through melodies overhead. They're strong enough as a unit to take a weird idea and give it shape — or context." "Carey rocks on trumpet and flugelhorn, displaying a crisp technique and warm musicality. All (except for #5) are original compositions, and they showcase his sharp style and the tightness of his band, all of whom get a chance to shine through ample solos." This is hands down the best cd of the year in any genre. It has a sound that reminds the listener of the great later period recordings of the Art Farmer Quintet or early sixties Miles Davis. If you like jazz...actually if you just plain like good music check this one out.